ATTENTION MEMBERS! WE’VE BEEN NOMINATED FOR THE HERALD’S “BEST OF THE BEST” SOCIAL CLUB FOR 2018, AND THE BALLOTS WILL BE PUBLISHED IN TODAY’S HERALD. PLEASE SUBMIT YOUR BALLOTS TO THE HERALD, OR DROP THEM OFF AT THE CLUB AND WE’LL SUBMIT THEM FOR YOU. WE’VE WON THIS AWARD EVERY YEAR SINCE 2014. LET’S DO IT AGAIN! AND AS ALWAYS, WE APPRECIATE YOUR MEMBERSHIP AND SUPPORT! Stop in, visit Ashley, and enjoy one of our many variations of the classic American hamburger or hot dog! Now featuring Brats and soup as well! As always, we feature $1 Yuengling pints all day! Ruby has performed at the Club numerous times in the past as a member of the Weedhawks. Catch her original solo acoustic guitar/violin/vocal act on our small stage Thursday night! This Warren-based blues/rock trio always puts on a fantastic show every time they play here! Mark (guitar), Sam (bass), and Jeff (drums) return with some new material and some old favorites! Voted as one of Youngstown’s top 5 acts. 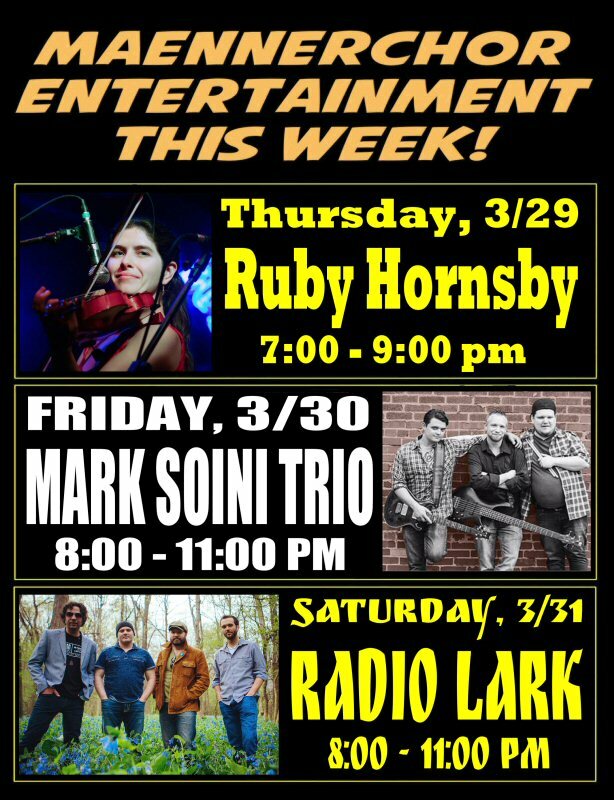 Radio Lark is a 5-piece band fronted by former filmmaker and Cedar’s bartender, Chris Rutushin. They perform original music influenced by the Indie alternative rock scene and light Brit-pop, including selections from their LP “Stolen Oranges” and more recent projects. This is a great original act to catch. Our draft beer selections are always changing. On tap are Guinness Stout, Blue Moon, Smithwyck’s Irish Red Ale, Harp Irish Lager, Evil Genius Adulting IPA, Dogfish Head Pennsylvania Tuxedo, Ommegang Lovely Dark and Deep Oatmeal Stout, Dogfish Head Sea Quench Gose, Spaten Original, Kostritzer Schwarzbier, Weihenstephaner hefeweizen, and Hofbrau Original! On deck: Anchor Nelson Pale Ale, Lagunitas Brown Shugga’, and Rogue Chocolate Stout.